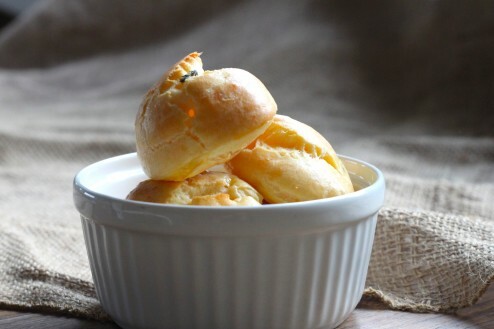 If you have ever had a profiterole you know how amazing and versatile the base choux dough can be. 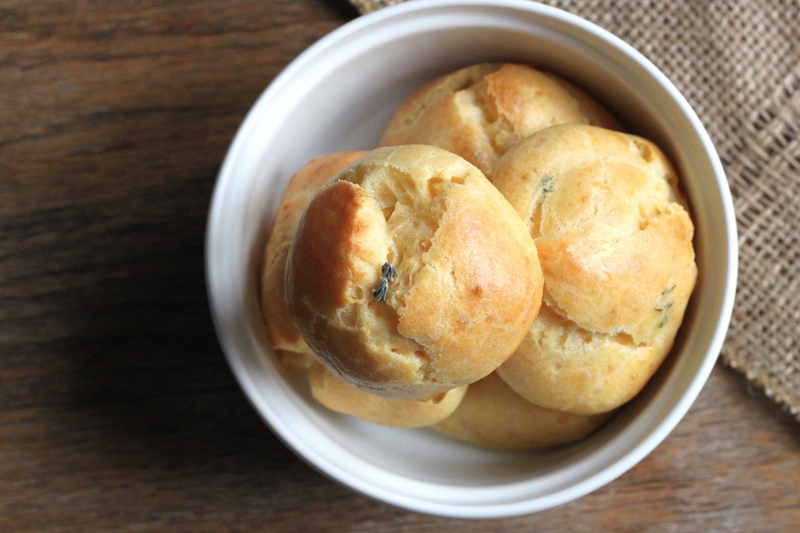 These little buttery, cheesy guys are pretty amazing – perfect for your Christmas or New Years Eve gathering (whether you are hosting a party or sitting on the couch in your pajamas)! What makes these things so amazing – cheese! Here is the base choux dough straight from the stove getting ready for the herbs, cheese and eggs. Nice and shiny. My choux dough here is slightly too runny. I added a pinch more flour to stiffen it up a bit. Take my advice, just keep checking it after the first egg and then after the second. You may need two or you may need all four. Don’t be afraid to get your finger in there to test its texture – it should be shiny yet remain parted after you run your finger through it. 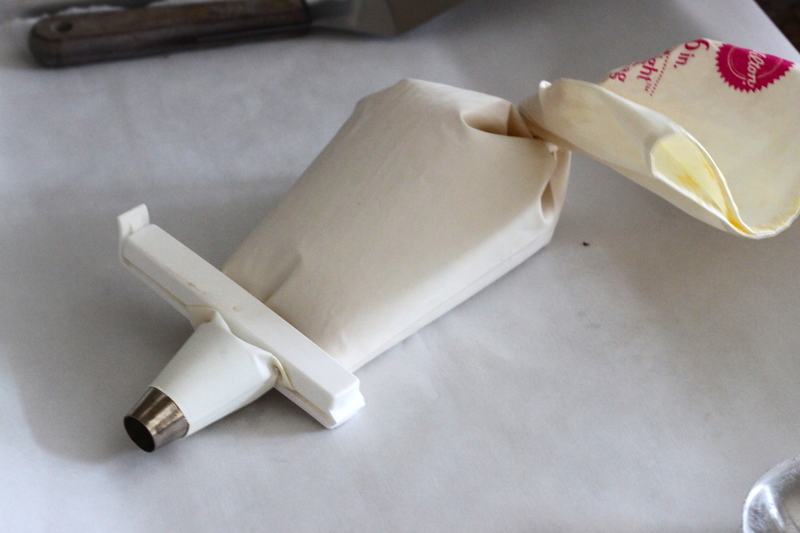 Just a little trick for filling your pastry bag. I clamp the end while I fill it up. So light, so airy – you can see through them. Line 2 large baking sheets with a baking mat or parchment paper. In a heavy saucepan bring butter and 1 cup water to a boil. Remove from heat and add flour, Spanish Paprika and salt. 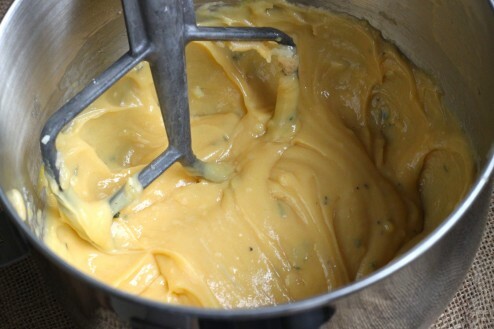 Stir in mixture vigorously until completely blended. Place saucepan back on the heat and continue to stir vigorously over medium heat until the mixture forms a ball, approximately 1 minute. Place ball in a stand mixer with the paddle attachment fitted. 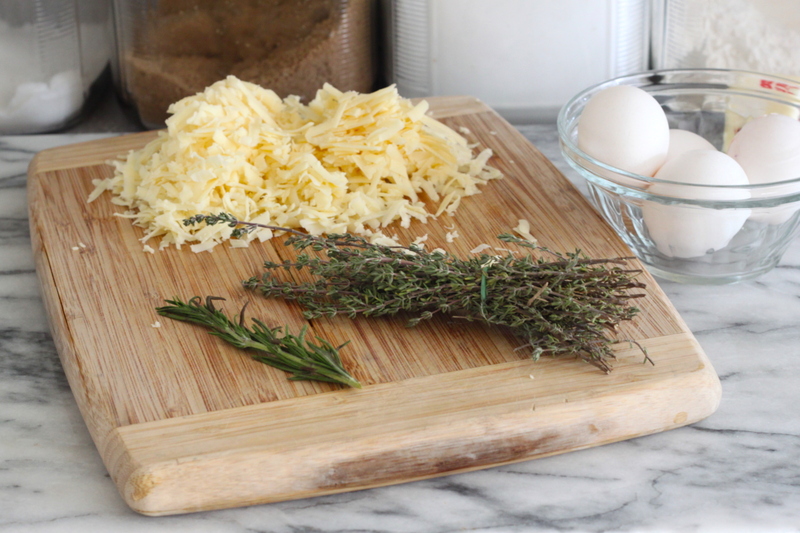 Add the cheeses, herbs and garlic and mix on low until blended. At this point you’ll want to add in your eggs, one at a time until completely incorporated. Depending upon the flour used and the temperature of the base mixture, you’ll want to check to make sure that the choux dough is not too runny. It should be shiny and it should be able to hold its form. Scoop your dough into a 16 inch pastry bag fitted with a ½ in tip. 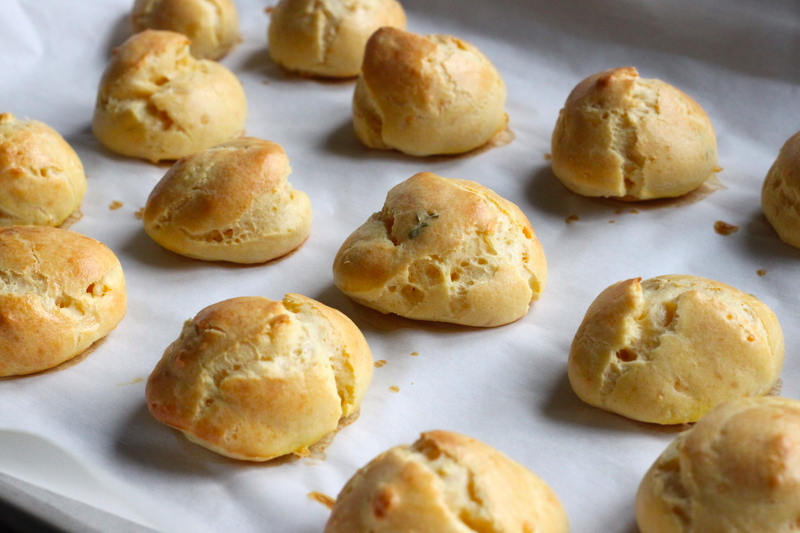 Pipe choux dough onto baking sheets in 1 inch rounds and 1 inch apart. 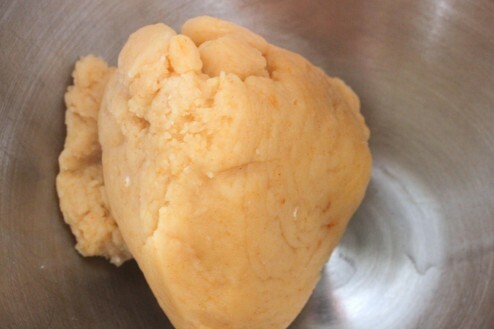 Mix one egg and 2 tablespoons of water in a small bowl. Brush egg wash over gougère with a pastry brush. 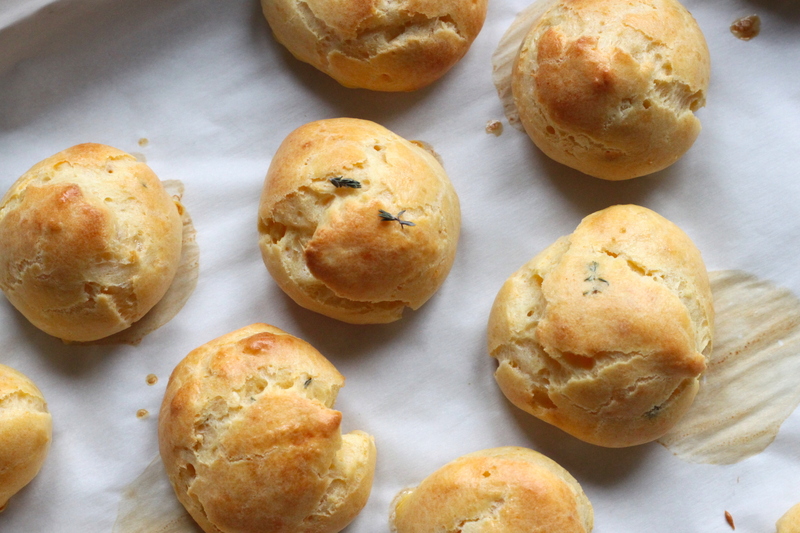 Bake until puffed up and golden, approximately 20 - 25 minutes. Sprinkle with herbs and serve.